Today’s Extraordinary Women Radio guest, Juana Bordas – has been the founder and CEO of several organizations. Juana has been a woman of action – where she’s seen a need – she’s found a solution and gone out and started it. Juan is an inductee to the Colorado Women’s Hall of Fame, and I’m always so honored to get to interview the inductees. Juana emigrated to the U.S. from Nicaragua on a banana boat. She’s led such an interesting life… and yes, we do talk about immigration in America today. The youngest daughter in a family of eight, she was the first to go to college. Upon graduating, she joined the Peace Corps and worked in the barrios of Santiago, Chile. Juana was a founder and executive director of Denver’s Mi Casa Women’s Center. Today, Mi Casa is is the largest Hispanic-serving organization in Colorado. She was founding-President of the National Hispana Leadership Institute (NHLI). In 2001 she founded the Circle of Latina Leadership focused on preparing the next generation of leaders. Juana was the first Latina faculty for the Center for Creative Leadership and taught in The Leadership Development Program – the most highly utilized executive training program in the world. She has designed, developed, and implemented leadership programs for national nonprofits, corporations, and government agencies across the country. Her award winning book Salsa, Soul, and Spirit: Leadership for a Multicultural Age is utilized in over 100 Universities. In 2014 her book The Power of Latino Leadership was recognized with the Nautilus Award for Best Multicultural book and the International Latino Award for leadership. Juana served as advisor to Harvard’s Hispanic Journal on Public Policy, the Kellogg National Fellows Program, as board vice chair of the Greenleaf Center for Servant Leadership, and a trustee of the International Leadership Association. Juana was selected as a Wise Woman Award by the National Center for Women’s Policy Studies. In 2017 she was selected by the National Diversity Council as one of the Most Influential and Powerful Latinos in America. To learn more about Juana, visit her Mestiza Leadership International website or follow her on Facebook or LinkedIn. 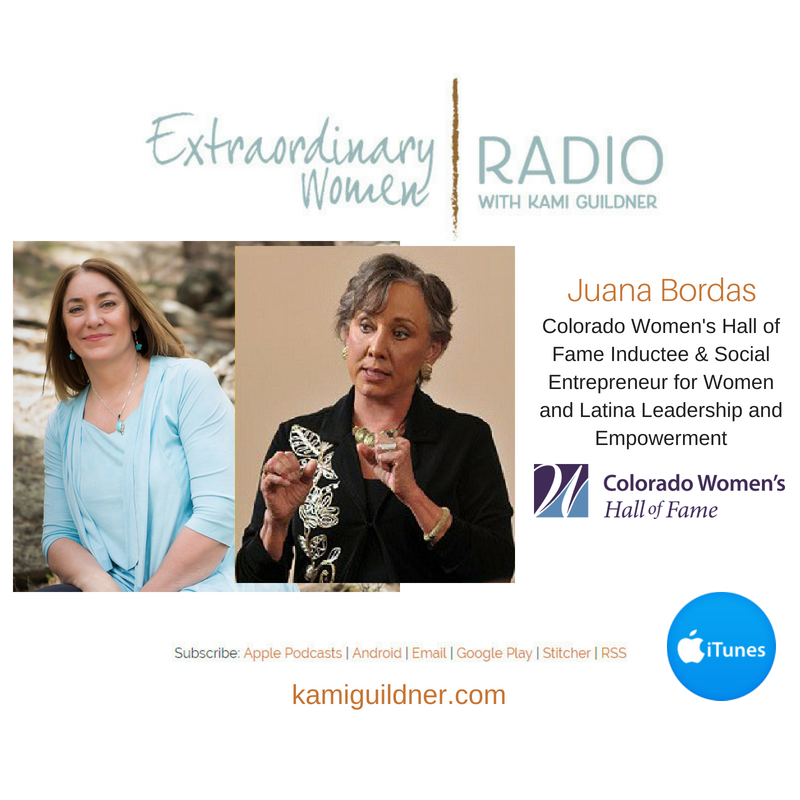 I’m honored to bring Juana Bordas to you today on Extraordinary Women Radio. Let’s meet Juana.